Not everyone is looking for a high-end, fully-featured full frame camera. But for those of you that want the best full frame on the market today, I'm guessing that your short list likely includes the Nikon D810, the Canon EOS 5D Mark IV, and the Sony A7R II. The trouble, of course, is that each of these cameras is excellent in their own right with features that will make any photographer drool. That makes the decision between the three a little more difficult. 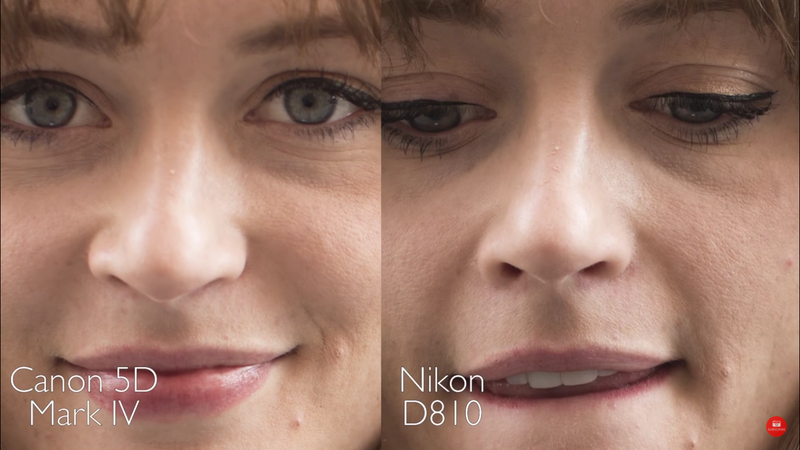 To help you in your quest for a new full frame camera, we've put together this side-by-side comparison. In it, you'll find a number of performance factors, from sensor size to image quality to dynamic range, all with each camera's capabilities there in black and white. To begin, let's outline some of the general specifications of each camera. Having a quick look at what these cameras have to offer is helpful as we break down their performance later on. Now that we have a better understanding of the essential features of these cameras, it's time to take a look at their performance on a number of key measures in a side-by-side-by-side real-world test. 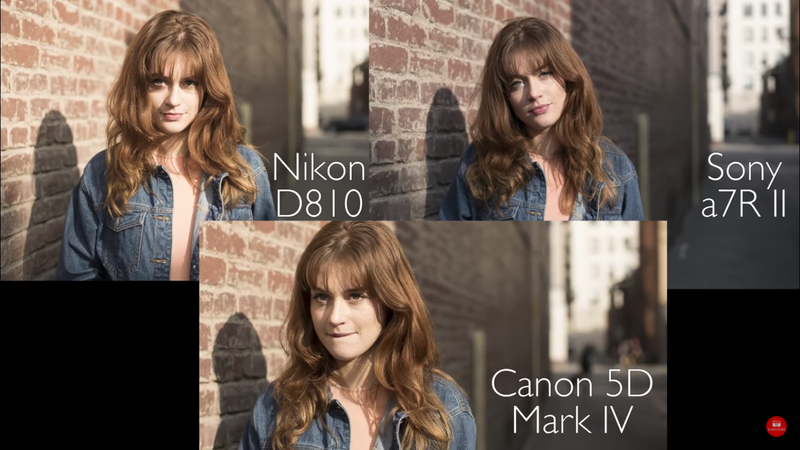 To undertake this test, Jay P. Morgan of The Slanted Lens, along with Kenneth Merrill, took to the streets to put these Nikon, Canon, and Sony cameras through the paces. Using tripod-mounted cameras with native lenses and the exact same camera settings for each test, Jay P. and Kenneth were able to get excellent head-to-head results on which we can compare these cameras. Check out their full real-world test in the video above. Their findings are summarized below. Shooting at f/2.8, 1/125th seconds, and ISO 100, the Nikon, Canon, and Sony cameras were tasked with taking a portrait of a model under blue skies. Because of the blue-toned lighting, each camera's white balance was set to 6000K. Despite using the same camera settings, there was surprising variability in the image quality produced by these three cameras. On the low end, the Canon had visible stepping and pixelation when its images were viewed at 1000% zoom. Of course, some pixelation is expected when zoomed in so far, but the Nikon and Sony images still had noticeable better quality at the same level of zoom. In fact, there is really no comparison here - the 5D Mark IV lagged far behind the D810 and the A7R II, both of which produced clean, sharp images even when viewed at 1000% zoom. And even between the Nikon and the Sony, there were still noticeable differences in the color rendition and contrast, with the Nikon producing the best results of the bunch. For the autofocus test, each camera was again mounted to a tripod. The focus was pulled to a close distance of 1.5 feet, and then a shot was taken of the model who was positioned further away, forcing each camera to reacquire focus for each of a series of five shots. This process was repeated again, but this time with the focus far away that had to be reacquired on a model that was positioned closer. This test revealed that the Canon was a bit sluggish to reacquire focus, but it was still able to do so with extremely consistent results from one shot to the next. The much bigger issue was with the Sony, however. Because the A7R II's sensor controls autofocus, you can't simply pull the lens out of focus by turning its focus ring. Instead, you have to navigate a maze of menus to try to work around this issue because the camera simply does not want to be out of focus. Because of this, the Sony wasn't able to complete this part of the test. 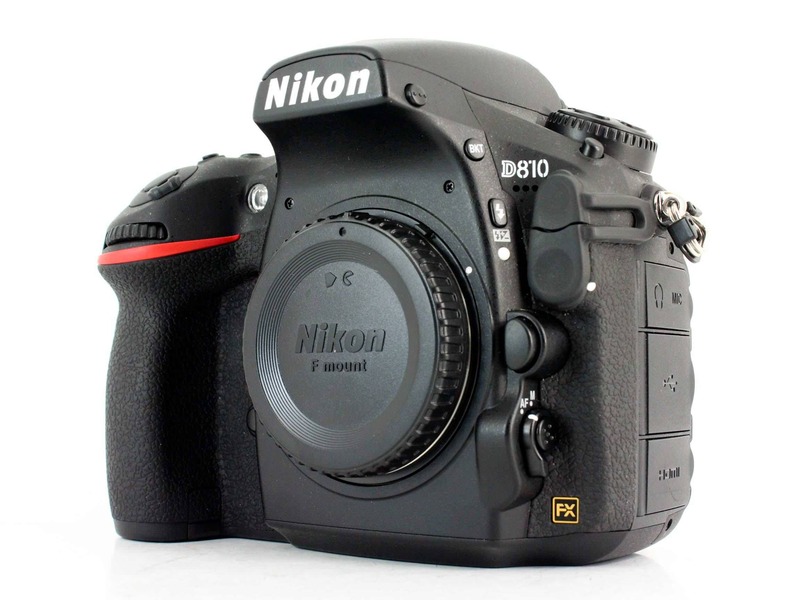 That leaves the D810, which produced sharp, clear, and accurate results with each frame. This was especially true when the focus was at a greater distance and then pulled to a close subject, though the Nikon did completely miss the focus on one out of the five shots. In fact, when comparing the Canon and Nikon results for this measure, it's almost startling how much better the D810 did than the 5D Mark IV - and that's saying something given that the Canon's results weren't bad at all. Now, there's a different story when these cameras track a moving subject with their autofocus systems. The Canon and Nikon cameras did a respectable job of tracking the portrait subject as she moved ever closer to the camera. The results were consistent and clear with each frame. Face detection gives you the ability to change the composition of the shot as the subject is moving, but the Sony will maintain focus on the subject's face seamlessly. That means you can frame the subject on the left side of the shot, then in the middle, then on the right, and back again, all without the camera ever losing focus. In this battle of maintaining focus on a moving subject, each camera did quite well. 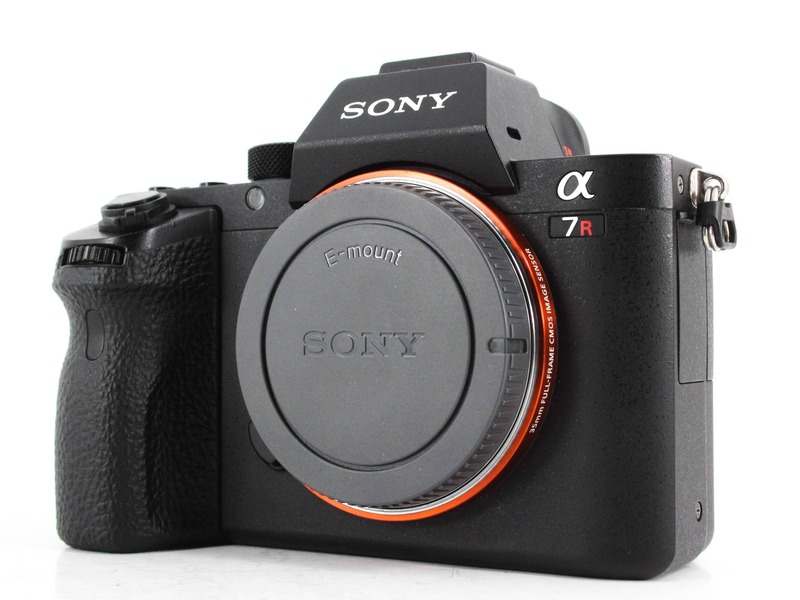 That said, it's tough to beat the next-level capabilities of the A7R II. To test out these rigs for dynamic range, a model was placed in direct sunlight with shadows and a white wall occupying territory in the background, such that there was a very wide dynamic range in the shot. The results reveal that the Canon did a great job handling this wide dynamic range, with an image that has a lot of detail, great contrast, and no blown out highlights or lost shadows. The Nikon, on the other hand, produced an image that was much more contrasty, with the model's face very bright and the white wall in the background very nearly lost. As for the Sony, the image had excellent open shadows and great detail in the highlights. And when compared to the test shots from the Canon and Nikon, it's evident that the Sony has the best dynamic range of the bunch by probably one-half to two-thirds of a stop. Taking the test indoors allowed for a head-to-head matchup of these three cameras in terms of low-light shooting performance. Shooting at f/1.8 with the white balance set to 4400K, what was discovered is that the Canon, Nikon, and Sony all performed very well through ISO 1600 and even to ISO 3200. But, once the ISO was pushed beyond that, there became clear differences between the three. The first to show degraded image quality was the Canon. However, though it showed more noise sooner, the noise it created was at least visually pleasing - its images had a distinct film look to them. The Sony started to show unappealing noise at around ISO 3200, which the testers described as "blocky" in the midtones and highlights - so not the nice, small, grain-like noise of the Canon. 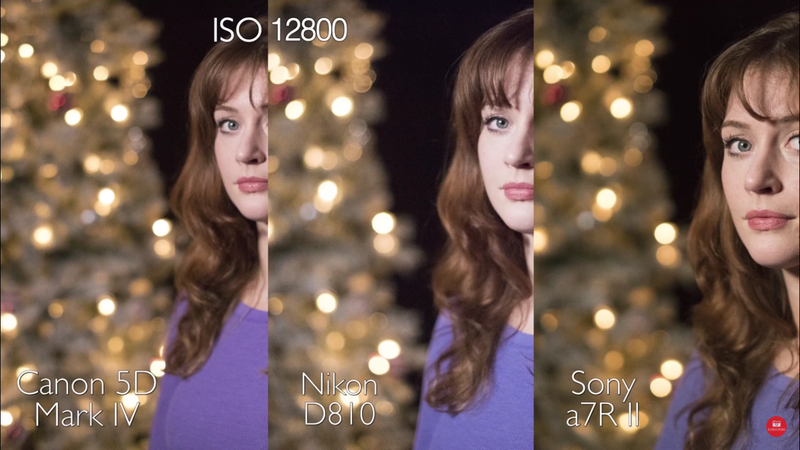 However, the Sony maintained a clean appearance in the area of the model's face clear through to ISO 6400, outperforming the Canon and Nikon in that regard. But, once the ISO reached 25600, the Sony image had clear banding across the model's face, which is something the Canon and Nikon avoided. The Nikon showed much more contrast in the shot than did the Canon (or the Sony, for that matter), but produced less desirable noise once the ISO was pushed beyond 3200 than was found on either the Canon or the Sony. The Winner: It's a draw. While the Canon had the nicest looking noise, the Sony had the best performance at ISO 3200 and ISO 6400. The Nikon, in turn, had images with the best contrast through the range up to about ISO 6400. 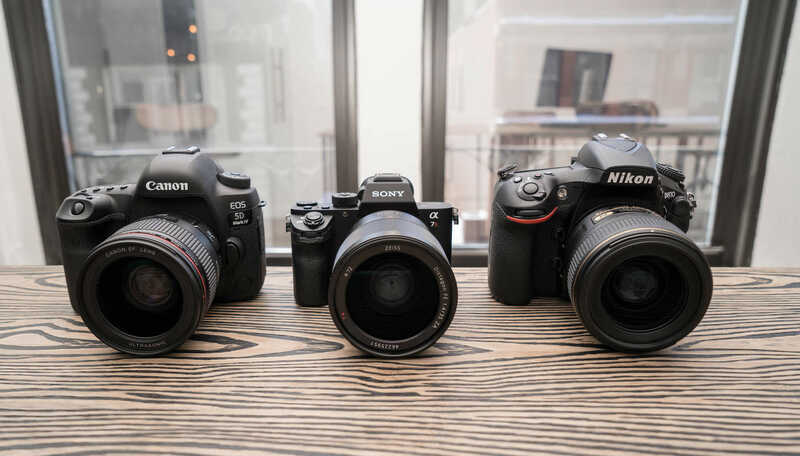 When it comes down to it, each of these cameras would be a great choice for professional and enthusiast photographers. However, based purely on the measures of image quality, autofocus performance, dynamic range, and low-light shooting, the Nikon D810 and the Sony A7R II outperformed the Canon 5D Mark IV. That being said, the differences were, by and large, fairly minimal, and for everyday shooting, aren't going to make a huge impact on what you can and cannot do with the camera. Likely what the decision between these three very fine cameras will come down to is what ecosystem you're already shooting in and the price. 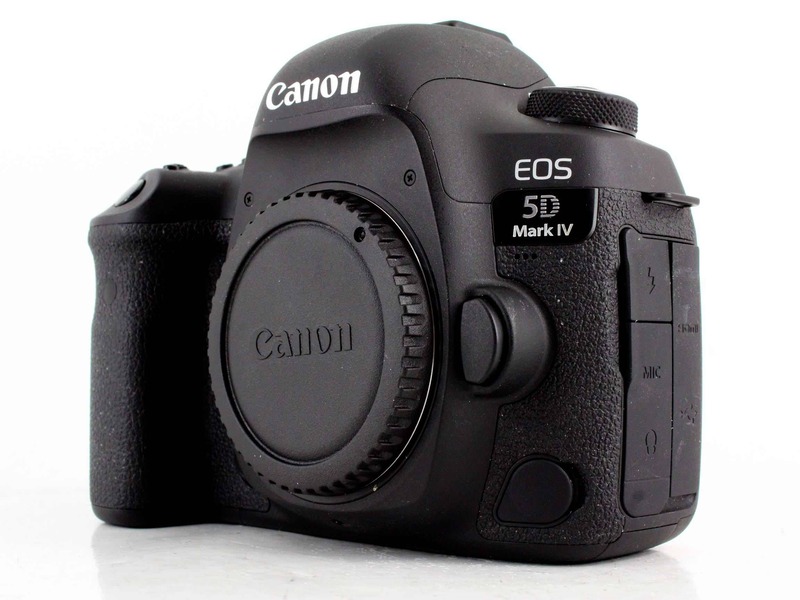 Meaning, if you're a Canon shooter and you've invested in a range of Canon lenses, going with the 5D Mark IV probably makes more sense. Likewise, if you're invested as a Nikon or Sony shooter, sticking with your current manufacturer will be easier on your budget. Whatever your choice, the Canon 5D Mark IV, the Nikon D810, and the Sony A7R II are solid, all-around choices.